Earlier this month, Disney revealed a new Tumblr page for Zootopia, which featured a number of parody posters that put an animal twist on some of this year's biggest movies. 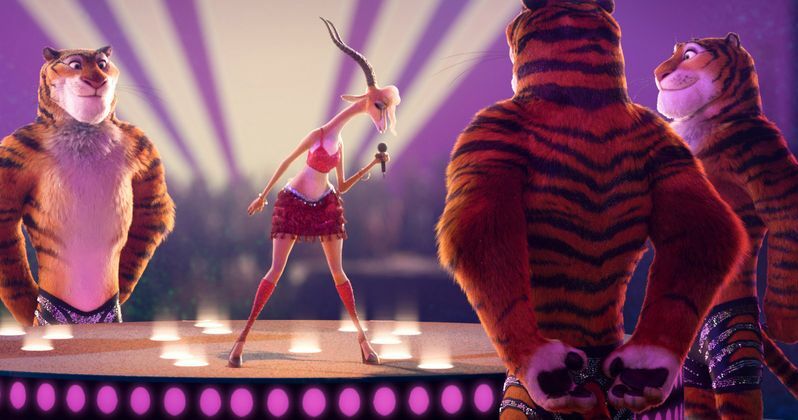 The page also teased that a special surprise would be released on "Zoo Year's Eve," and today we have the third trailer for this upcoming animated comedy, arriving in theaters March 4, 2016. The trailer features the all-new original song "Try Everything," written by singer-songwriter Sia and songwriting duo Stargate, and performed by Grammy®-winning international superstar Shakira. The single will be available everywhere on January 8. The supporting voice cast is rounded out by Shakira, Idris Elba, J.K. Simmons, Nate Torrence, Jenny Slate, Tommy Chong, Octavia Spencer, Bonnie Hunt, Don Lake, Alan Tudyk, Tommy Lister, Katie Lowes, Jesse Corti and John Di Maggio. It was also announced last month that Michael Giacchino will provide the score, his first collaboration with Walt Disney Animation Studios. The studio will also release another animated adventure next year, Moana, arriving in theaters one year from today, starring Dwayne Johnson. Zootopia is directed by Byron Howard (Tangled, Bolt) and Rich Moore (Wreck-It Ralph, The Simpsons), and co-directed by Jared Bush (Penn Zero: Part-Time Hero). The screenplay was written by Jared Bush and Phil Johnston (The Brothers Grimsby), with Clark Spencer (Wreck-It Ralph, Lilo & Stitch) serving as producer. For fans who plan on attending Disney Parks in the new year, you can also get a sneak peek of this movie . Starting January 21, guests visiting Disney Parks will be able to catch a preview of scenes from Disney's hysterical comedy-adventure Zootopia in sneak peeks planned for Disney California Adventure park and Disney's Hollywood Studios. At Disney California Adventure park, the Zootopia preview will be presented at the Bug's Life Theater with special in-theater effects. Guests at Disney's Hollywood Studios will get to see this advance look at clips from the film as part of the One Man's Dream attraction on Mickey Avenue. In addition to the trailer, we have four new photos, which you can check out below, and stay tuned for more on Zootopia.